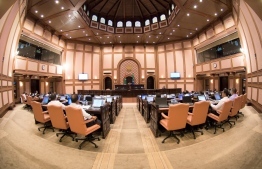 The parliament, on Monday, passed the bill to annul the amendment to the Constitution ratified in former President Abdulla Yameen Abdul Gayoom's administration, which allows foreign parties to own land in Maldives. The Constitution can only be amended with a two-third majority of the parliament, which consists of 64 members out of the current 85 MPs. The 64 members that were present in the session all voted in favour of nullifying the amendment. President Ibrahim Mohamed Solih's electoral pledges included nullifying the foreign ownership amendment. President Solih was among the few MPs that publicly rejected passing the amendment in the first place, during Yameen's government. Proposed by former Villimale' MP Ahmed Nihan Manik, this amendment was passed on July 22, 2015, allowing those who invest USD 1 billion by reclaiming land in Maldives to own a part of it. The foreign ownership amendment was passed with the vote of 70 members, including those from Jumhooree Party and then opposition Maldivian Democratic Party (MDP). Only 14 members voted against the amendment. Maafannu South MP Abdulla Rifaau submitted to nullify the foreign land ownership amendment in November 2018, claiming that allowing foreigners to own Maldivian land compromises the freedom and sovereignty of the state. Article 251 of the Constitution states that "no foreign party, shall own or be given ownership of any part of the territory of the Maldives". However, to incorporate the amendments, Yameen's administration added a 15th chapter to the Constitution containing Articles 302 to 309, and altered Article 251 quoting the circumstances mentioned in Chapter 15 as an exception. Rifaau's amendment to annul this chapter was passed by the parliament's Committee on National Security without any alteration after review. The parliament will go on a one-month break at the end of this month, and resume sessions for its next tenure during the first week of June. The newly elected MPs will be sworn into parliament on May 28.